Question: Can students use notes in events? Response: In general, notes and reference materials are permitted unless they are prohibited in the rules. When notes are allowed in an event, the notes may not interfere with the stations or arrangements associated with the event. If stations are used, there may not be space for notes on the table at the station. If the event involves a paper and pencil answer sheet, there may not be room for the notes at the desk. If the notes are cumbersome due to their size or configuration, the event supervisor may direct the students to put the notes away. There may not be available space to open and flip through a binder, for example. Notes may not be practical in elementary events since they are 30 minutes in duration. This may require that the logistics of conducting the event vary from the description in the rules manual. If an event is conducted as stations where students rotate to different stations, there may be only a minute or two at each station. Students will have little opportunity to refer to notes, reference materials, identification keys, or other notes. while at each station. Question: Can students bring and use notes? Response: Notes and other resources are not permitted in the Food for Thought event. Students should be prepared to use their understanding of the concepts described in the event description to complete the activities of the event. A: The event description indicates that the students will construct the chopper "...using one sheet of cardstock and one paper clip." This is interpreted to mean that both of those materials, and only those two materials will be used in the chopper. Note that due to constraints of time, the event supervisor may select two of the three rotation/orientation options. 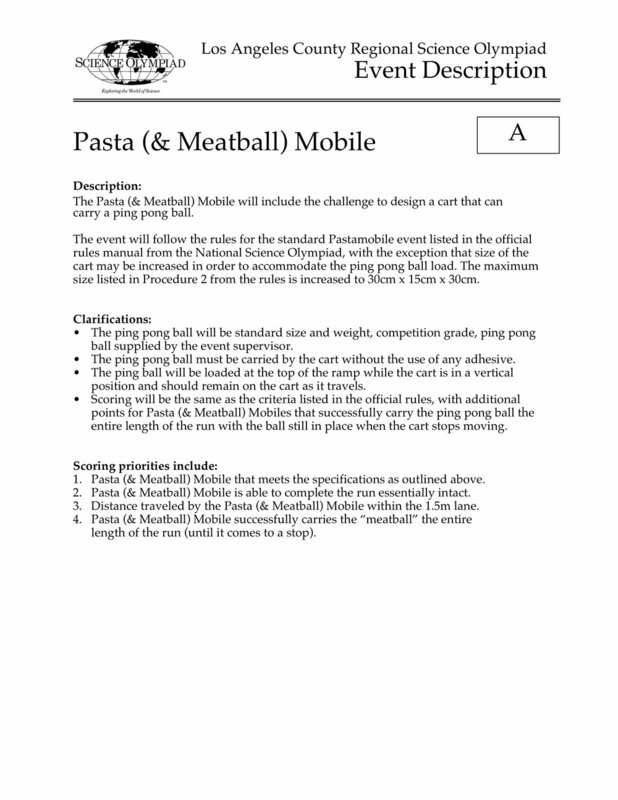 The Pasta (&Meatball) Mobile event will follow the rules for the standard Pastamobile event listed in the official rules manual from the National Science Olympiad. However, the size of the cart may be increased in order to accommodate the ping pong ball load. The maximum size listed in Procedure 2 from the rules is increased to 30cm x 15cm x 30cm. The ping pong ball will be standard size and weight, competition grade, ping pong ball supplied by the event supervisor. The ping pong ball must be carried by the cart without the use of any adhesive. The ping ball will be loaded at the top of the ramp while the cart is in a vertical position and should remain on the cart as it travels. Scoring will be the same as the criteria listed in the official rules, with additional points for Pasta (& Meatball) Mobiles that successfully carry the ping pong ball the entire length of the run with the ball still in place when the cart stops moving. Additional details for the modified Pasta (& Meatball) Mobile can be downloaded from this web page. A: Students should be prepared to hit a target up to five (5) meters away form the foul line. We realize that the directions are unclear and encourage students to be prepared for any iteration of the limits indicted in the rules. This event will consist of a written test in which the contestants will view models, slides, and pictures to identify organs from the following animal body systems. Both structure and function will be tested in a series of written questions. Every team will be given an answer sheet. Team members may consult with each other by writing (no talking). Only one answer for each question will be accepted. Team members will move through 20 stations answering approximately 40 questions. Questions will be at the stations or in a test booklet. At the end of the testing period, the questions and answer sheet will be collected from those teams who have not turned in their responses. Time is not a factor in scoring. Click here to download a printed copy of the A is for Animal Anatomy Event Description. The event will generally follow the rules described in the Elementary Science Olympiad rules manual with the exception that all observations and conclusions will be made prior to the Science Olympiad tournament and submitted online. The written test described in the rules manual may not be included or may be a part of the online submissions. NOTE: Teams are expected to obtain at least five (5) owl pellets from a commercial source. Description of the owl pellet(s) prior to dissection. Identification of bone(s) found in the owl pellet. Submission of one or more photos of individual bones. Number of prey species found in each pellet and evidence for that conclusion. Identification of prey species found in each pellet and evidence for the claim. Conclusions regarding food webs and habitats of the owl that produced the pellets. Student ideas regarding ecological considerations related to owl habitats. All necessary materials are provided by the school/team. On or before this date, students will submit observations, identifications, conclusions and evidence for their ideas, in response to directions and questions posted online. On or before this date, students will respond to an additional question(s) regarding owl habitats, owl food webs and ecological considerations related to owl habitats. Specific instructions for submitting responses will be shared to help students be prepared to submit online. A link to submit responses will be included and be posted online at http://www.lacountyscienceolympiad.org. Reasonable conclusions regarding owl feeding habits and ecological habitat implications. Supporting claims with reasonable evidence. Click here to download a printed copy of the Food Webs … Owl Pellets Event Description. Click here to download a detailed description of Food Webs Online Submission Details. Students will construct a device that will house decomposing leaf litter ora living plant terrarium from 2-liter soda bottles. Once started, the bottle is left alone and the students’ record their observations, and draw conclusions. Scoring is based on students’ research, observations, data collection and conclusions. The Soda Bottle Decomposition Column is a miniature compost pile, or as leaf litter on a forest floor. Through the sides of the bottle you can observe different substances decompose and explore how moisture, air, temperature and light affect the process. The Soda Bottle Terrarium is an experiment to observe plants in a closed environment; and while it is growing you can observe the life cycle of plants. Minimum two but the whole team may participate. The teams will construct a Soda Bottle Decomposition Column or a Soda Bottle Terrarium with help from adults. Students will submit their research and observations on-line. Photographs are required at each deadline. Late submissions are allowed but 5 points will be deducted from the score. Identify the start date of the project. Photo of the team starting the project. Observations made during the period from the start of the experiment to Dec. 3rd. Pictures of the soda bottle. NOTE: This email address is for sending photos and videos only. Do not submit questions to this address. Click here to download a printed copy of the Bottle Biology Event Description. Watch It/Write It requires a team of students to observe some phenomena presented by the event supervisor and then describe the phenomena and their ideas about the phenomena using words, drawings, diagrams, labels, etc. Watch It/Write It emphasizes observation, communication and developing and using models. Students should be prepared to observe carefully and develop a written model to represent their observations. Paper will be provided. Students must bring sharpened pencils or pens and may bring colored pencils or pens. The Watch It/Write It challenge is designed to require students to observe carefully and describe their observations in words, pictures, diagrams, etc. The written description presents a model of the phenomena as well as the students’ ideas about what is going on and why. Students’ preparation might include making a variety of observations of natural or man-made phenomena and describing the ideas in writing. Observe the operation of toys or simple science experiments. Observe phenomena multiple times to check for missed observations. Practice describing the steps of a process in words, diagrams, pictures, etc. Practice ways to represent forces or unseen parts of a phenomena with words, symbols, etc. Practice explaining ideas about observations and why some phenomena is happening. Scoring is based on the ability of the students to observe carefully and represent their observations in a written model that describes their observations clearly and describes their ideas about the phenomena, including evidence they have for their ideas. A significant focus of the Next Generation Science Standards NGSS) indicates that science education should be more authentic to the way science and engineering are practiced in the real world – intentionally including Science and Engineering Practices, Disciplinary Core Ideas, and Cross-Cutting Practices. Two significant Science and Engineering Practices for upper elementary students include developing and using models, and supporting ideas/arguments with evidence. A quick look at a few of the Performance Expectations for upper elementary grades reveals frequent use of language like, “Develop and/or use models to describe and/or predict phenomena,” or “Develop a diagram to describe or explain a process.” Models need not be 3-D constructions, but are often drawings, labeled diagrams, sequence frames (like cartoons) that show relationship or change over time, etc. The event Watch It/Write It is designed to provide students with an opportunity to engage in these fundamental Science and Engineering Practices. The phenomena students’ will observe will not be shared prior to the Science Olympiad. The event includes the ability of the students to react to a potentially new experience with careful observations, reasonable ideas supported by evidence, and clear written communication in words, diagrams, drawings, etc. Provide the students with things to observe and describe. Provide practice writing and drawing to describe the observations and ideas. Resources include science activity books from the library that include hands-on things to do and observe. Here are some examples to illustrate using phenomena to prepare for this event. The phenomena to observe might be sprinkling iron filings on a piece of glass and then placing a metal rod and or disk (magnets) under the glass near the iron filings in different orientations and arrangements. Students then represent what they have observed and discuss their ideas about what might be going on. The best work will clearly and reasonably summarize the observations and include an explanation of what the students think might be going on. Another example would be to take a shallow tray of water, like a pie pan or cookie sheet. Cut out an oval- or boat-shaped disk of cardstock with a slit or “v” shape cut into the back end. Cut a tiny sliver of soap and edge it into the slit or “v” shape. Place the boat into the water and observe what happens. Try different types of soap. Try liquid soap or dishwashing liquid. Does the type of soap change the phenomena? Does the phenomenon stop working after a period of time? Describe the observations and ideas with words, diagrams, drawings, cartoon sequences, etc. The best work will include clear communication, employ the models to explain ideas, and include some evidence or rationale for the ideas. Note that the ideas need not be correct. First ideas are often naive or lack sophistication. A keystone value of representing observations and ideas with models is that they can be revised as new experience is encountered. Click here to download a printed copy of the Watch It/Write It event description.